Grey Thoroughbreds seem to have a special attraction to racing fans. With the plethora of bays, dark bays and chestnut coloured horses dominating most of the entries in every race on a day’s race card, the appearance of the distinct grey stands out. The coat of a grey horse becomes lighter as they age, making the contrast more noticeable. If the said grey becomes a consistent winner, or even a champion, the public seem to gravitate toward the animal and adopt him or her as a personal favourite. Holy Bull was a great example of this phenomenon. Bred by Rachel Carpenter’s Pelican Stable in Florida, Holy Bull came into the world on January 24, 1991. The broodmare Sharon Brown presented the world her new grey son. Sharon Brown was a grey herself and was a modest winner of three races from thirty-two starts. She was by Al Hattab, a grey grandson of the important sire Mahmoud. Her dam was Agathea’s Dawn, a grey daughter of Grey Dawn II. Grey Dawn II was a strong source of fine producing broodmares. The sire of Holy Bull is Great Above, a son of Minnesota Mac who in turn is a son of Rough ‘N Tumble. This was a predominately Floridian line of sires that descend from the great sire Himyar, a foal of 1875. Himyar was perhaps the dominant sire in his day. Two prosperous branches in the line came from his sons Domino and Plaudit. It is the Plaudit branch that leads to Holy Bull, some ten generations later. Ta Wee, two times champion sprinter, is the dam of Great Above. Ta Wee is a half sister to the legendary Dr. Fager, the horse that Holy Bull’s running style reminded racing fans of. Great Above was a good honest stakes winner, the Toboggan Handicap being his biggest win. He became a top quality regional sire when sent to stud in Florida. Occasionally a sire of regional stakes races, races that are only available to horses sired and/or bred within a specified region, will get a good quality competitor in open stakes company. Rarer still, a regionally bred horse becomes a champion in open company. Great Above sired 1994 Eclipse Award Champion Three Year Old Holy Bull, winner of thirteen races from sixteen starts. The colt raced under the colours of trainer Jimmy Croll. 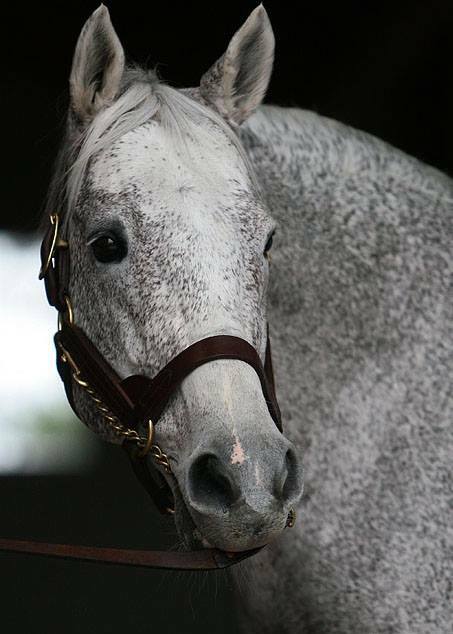 Holy Bull came to be owned by Croll through an inheritance in the will of Holy Bull’s breeder Rachel Carpenter. She passed away the day before Holy Bull made his racing debut. Croll had known Carpenter and trained her horses for more than thirty years. However he was unaware of the gift until a few days later when he was informed by Rachel Carpenter’s daughter of the provision within the will. Carpenter had left six horses in total, which included Holy Bull, to her loyal trainer and adviser. A truly generous gift. Croll had always had high hope for the lovely grey son of Great Above after seeing him as a yearling, but even in his wildest dreams could he have imagined the greatness this horse would achieve. In the following two races, Holy Bull redeemed himself to his growing army of fans and admirers. He won the grade one Florida Derby and then continued his winning form in the Blue Grass Stakes thus making him the favourite for the Kentucky Derby. There was much anticipation connected to “The Bull”, as his adoring public referred to him. Unfortunately his one major blemish to his wonderful racing career came in the Kentucky Derby. On a very sloppy track, Holly Bull finished a lacklustre twelfth behind Go For Gin. He never seemed to be himself that day. He appeared lethargic and was never a factor in the race. Jimmy Croll gave Holy Bull a short rest and skipped the Preakness Stakes. “The Bull” returned to racing in the Metropolitan Mile, twenty-nine days after his disappointing Derby. The powerful grey returned to his winning ways with a commanding performance against older rivals, winning the Met Mile in a very good 1:33. 80. Among the horses he beat were Cherokee Run, who would be named as the champion sprinter for the year, and multiple grade one winner Devil His Due. “The Bull” was back and raring to go. His fans could not have been happier, and flocked to the track to cheer him on. Holy Bull remained at Belmont for his next start, a dominating victory in the Dwyer Stakes. Croll then mapped out a challenging schedule for his star performer that, as it turned out, took him to championship status in America. Next up was the Haskell Invitational at Monmouth Park. Holy Bull shot out of the starting gate and took command right away. Under the guidance of jockey Mike Smith, the big grey set a comfortable pace on the lead and then pulled away down the home stretch to win by two lengths. Now on to Saratoga for another prestigious grade one race, the Travers Stakes. The race at Saratoga had attracted the reigning Belmont winner Tabasco Cat as well as Concern, who would later win the Breeder’s Cup Classic. Commanche Trail was also entered, to act as a rabbit to challenge Holy Bull early, by the connections to Tabasco Cat. Commanche Trail did do exactly as planned, pushing Holy Bull into early fractions of 22 4/5 for the first quarter and 46 1/5 for the half mile, while Tabasco Cat sat behind in a stalking position four lengths behind. Concern was far back, fifteen lengths arrears. After a 1:10 2/5 for six furlongs Commanche Trail had enough. Holy Bull kept going, gaining a clear advantage. By the time Holly Bull got to the top of the home stretch, he was five lengths clear. Concern however was coming hard with his patented late rush, and look a certain winner. In a display of courage that only a champion could have, Holy Bull kept going all out to repel the challenge from Concern and won the Travers Stakes. They crossed the wire a head apart, Holy Bull first, Concern second and Tabasco Cat fifteen lengths behind in third. Fans of “The Bull” were ecstatic. He likely gathered many more to his legion of admirers following this memorable performance. It was a performance of the ages. Holy Bull displayed a rare and unforgettable example of what a true equine champion is capable of. He ran as fast as he could, going one and a quarter miles flat out, refused to give in, and refused to be beaten. The adoring public would have more to cheer for with Holy Bull’s next race, when he unleashed a devastating performance against most of the top horses in training that year at Belmont cementing his legend. Jimmy Croll kept to his schedule and entered Holy Bull in the Woodward Stakes exactly four weeks later. Holy Bull came out of the Travers in good condition, but very tired. In the starting gate, “The Bull” met up with Devil His Due, Go For Gin, defending Woodward winner Bertrando and the previous year Belmont Stakes winner Colonial Affair. Holy Bull was bet down to 4-5 by the Belmont faithful. He would not disappoint them. In a change of tactics, Mike Smith did not send Holy Bull to the lead from the off. Instead he let Bertrando set a moderate pace while he stalked on the outside in second. Through the far turn, Smith let “The Bull” loose. His grey partner powered around the turn and through the home stretch. Holy Bull won the Woodward by five dominating lengths over a stellar field. Devil His Due and Colonial Affair ran second and third respectively, but they were no match for “The Bull”. Quite frankly, he crushed a very talented field. The public adulation was justifiably earned. The fan mail to Holy Bull was enormous. There were t-shirts, caps, and trading cards available for fans of the newest hero of the turf. Croll decided to rest his prised steed for the remainder of the year, thus by-passing the Breeder’s Cup. He wanted his horse fresh for the winter/early spring races in Florida and campaign him in front of his fans in his native state. Despite not entering the Breeder’s Cup and not winning any of the Triple Crown races, Holy Bull earned the Eclipse Award as the Champion Three Year Old Colt. Holy Bull was so impressive, the voters could not ignore him. As a four year old, Holly Bull opened his season by winning the Olympic Handicap handily. In his next start. the Donn Handicap, he pulled up with strained ligaments. Jimmy Croll retired his champion immediately. The Donn Handicap in hindsight, became a passing of the torch from one champion to another. The winner of the race was none other than Cigar, who would go on to a perfect ten for ten campaign that year. The two had pulled away from the field and were embroiled in a personal match race, until Holy Bull unfortunately became injured, forcing jockey Mike Smith to ease the outgoing champ. Jimmy Croll sold Holy Bull to stand at Jonabell Farm in Lexington Kentucky for the 1995 season. The farm is now owned by Sheikh Mohammed bin Rashid Al Maktoum’s Darley Stud group. At stud Holy Bull sired Giacomo, who accomplished victory in the one big race that eluded his sire, the Kentucky Derby. Sweet revenge for The Bull’s fans, and at huge odds I might add. Other stakes winners by Holy Bull include Flashy Bull (Stephen Foster Handicap), Confessional (Frizette Stakes), Bishop Court Hill (Carter Handicap), Woke Up Dreamin’ (Smile Sprint Handicap),Bull Honkie (Champion two year old filly in Ecuador), Bwana Bull (El Camino Real Derby),and Pohave (Triple Bend Breeder’s Cup Invitational). Macho Uno is a half brother to champion Breeder’s Cup Classic winner and top sire Awesome Again. He too became a Breeder’s Cup winner taking the 2000 Juvenile event over Point Given and Street Cry. This performance followed his seven length triumph in the Grey Stakes at Woodbine. Macho Uno was named the Eclipse Champion Two Year Old in America. Bred and owned by Frank Stronach’s Adena Springs, he now stands successfully beside his half brother at the Adena Springs Kentucky farm division. Macho Uno has sired Mucho Macho Man (Breeder’s Cup Classic), Wicked Style (Breeder’s Futurity), Macho Again (Stephen Foster Handicap), Potesta (Hollywood Oaks), Overheard (Dance Smartly Stakes),and Argentine champion Private Zone, so far in his young career as a sire. Holy Bull is emerging as a very good broodmare sire. His daughter Holy Blitz is the dam of champion Judy The Beauty, sired by Ghostzapper a son of Awesome Again. Bred by the Adena Springs Ontario division, Judy The Beauty has chalked up wins in the Breeder’s Cup Filly and Mare Sprint, Madison Stakes, Shady Well Stakes, Las Flores Stakes, Rancho Bernardo Handicap and the Thoroughbred Club of America Stakes. She has nine wins, eight seconds and one third from nineteen starts, at the time of writing. Further very good stakes winners from daughters of Holy Bull are Munnings (Champagne Stakes, Woody Stephens Stakes, and Gulfstream Park Sprint Championship), Going Ballistic (Super Derby, Oklahoma Derby), Enforce (Conqueror Stakes), and Cairo Prince (Nashua Stakes, Holy Bull Stakes). The honours for Holy Bull kept coming his way when in 2001 he was inducted into the National Museum of Racing Hall of Fame, his first year of eligibility. He was voted as the sixty-fourth best horse in the twentieth century by the Blood-Horse magazine in their famous end of the century poll. Holy Bull has remained at Jonabell for his entire stud career and is now an honoured pensioner at the famous farm. He is the sire of fifty-one stakes winners, and is viewed, rightly so, as a wonderful outcross to the fashionable sire lines in current vogue with breeders. The daughters of Holy Bull are keenly sought as broodmare prospects by many breeders for this reason. His speed and heart are vital ingredients breeders seek in their mating decisions. His best son Macho Uno is doing his part to keep the tail male line moving to future generations. Jonabell Farm, now a division of the world-wide Darley Stud Group, receives many visitors from Holy Bull’s army of fans, eager to see him first hand. His popularity has not waned with the passing of time. “The Bull” entertains his guests with his charming demeanour and of course most of his fans snap pictures of him. The internet is chock full of fan pics of their beloved favourite grey. Still a star, Holy Bull is the resident celebrity. No one will forget his courage, determination and power. Ed note update: Holy Bull sadly passed away on June 7,2017 due to the infirmities of old age. He is buried at Jonabell Farm in Kentucky. Thank you for this super write up about a great champion. Incredible piece about an incredible horse. Holy Bull would be proud.